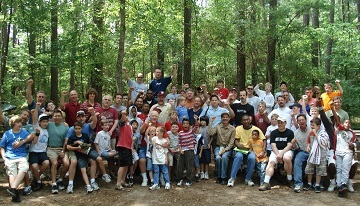 After his weekend experience at the church’s father-son retreat, he met with the pastor and said, “I want what your men have.” He had seen men discussing tough topics in small groups, dads enjoying time with their sons and fathers praying a specific blessing over their sons in front of the whole group. He had never witnessed such real relationship among men before. One older man in the group without a son at the retreat shared a story of success in the business world. He had worked long hours and traveled a lot to provide well for his family. He had even completely funded the college accounts for each of his three kids. He delivered a powerful message on the priority of investing in relationships with your kids, not just in their college accounts. He applauded the dads and sons for committing the time to each other across the weekend. He had never done that with his sons and today, while they are all successful, they do not have time for him. He confessed that the wrong message had been conveyed through what he prioritized over the years. “… Who do people say I am?” They (the disciples) replied, “Some say John the Baptist; others say Elijah; and still others, one of the prophets.” “But what about you?” Jesus asked. “Who do you say I am?” Peter answered, “You are the Christ.” – Mark 8:27b - 29. How is it possible that the people missed the Message? Jesus had preached to them and performed miracles in their midst! I can only guess they had drawn conclusions based on their limited capacity to comprehend all that had happened during His short time with them. So how could Peter be so sure Jesus was the Christ? The disciples had been with Jesus for several years. Through His physical presence, emotional engagement and spiritual leadership, His message and identity were caught. The pastor told the dad that his day to day example in life would always be received loud and clear by his kids. Whether the priority is success in the world or faithfulness in relationship with Jesus the Christ, there is a message received about who you say He is. A generation is at risk and it is up to dads to prioritize physical presence, be engaged emotionally and lead spiritually by example to ensure the Message is received. Prayer guide: My Father, thank You for Your Word and for the Word becoming flesh. I confess that I send a lot of mixed messages to my family as I try to balance all that is going on in life. Forgive me. Life under You is not about balance. It is about right priorities. Grant me discernment on this journey as a father to follow Your example, to prioritize physical presence, be engaged emotionally and lead spiritually by example. Help me convey the right message through my daily example, a message that glorifies You in my children’s eyes. In Jesus’ name. Amen. A faithful father conveys the message that Jesus is Lord through his daily example.